Oscar went to the veterinarian yesterday for his final skin scrape and third Ivermectin injection. The skin scrape showed no mange mites or bacteria, so Oscar is mange free! His skin still hasn’t completely healed, but it is slowly improving. He seems to be his happy, spunky self again! We have learned a lot about mini pig mange throughout the past few months, but we are so glad to get back to normal life with our little piggy. Although I hope we never deal with mange again, it has taught me to not take for granted the little, everyday moments with Oscar. I have missed him squealing while running through the house, his afternoon cuddles, and even him constantly undoing the Velcro on my sandals. The one downside to our good news is that Oscar and the dogs are still separated for a few more days. We decided late in Oscar’s treatment to also treat our dogs for mange, and their treatment isn’t finished yet. The dogs didn’t have any obvious mange symptoms, but we wanted to cover all of our bases so that the mange doesn’t return. Our main concern right now is making sure Oscar doesn’t somehow get reinfected, but hopefully the extensive treatment has taken care of the issue completely. I was initially hesitant to talk about Oscar’s sarcoptic mange, but I’m glad I did. I’ve discovered that we definitely aren’t alone in dealing with mini pig mange, and I’m so grateful for the support we’ve received. 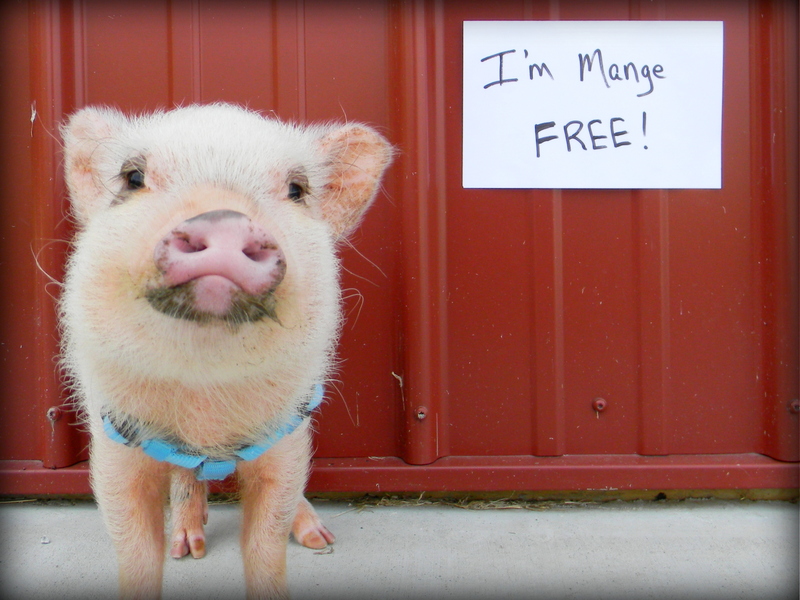 If you’re dealing with mini pig mange and have any questions or want to share your experience, I would love to hear from you! 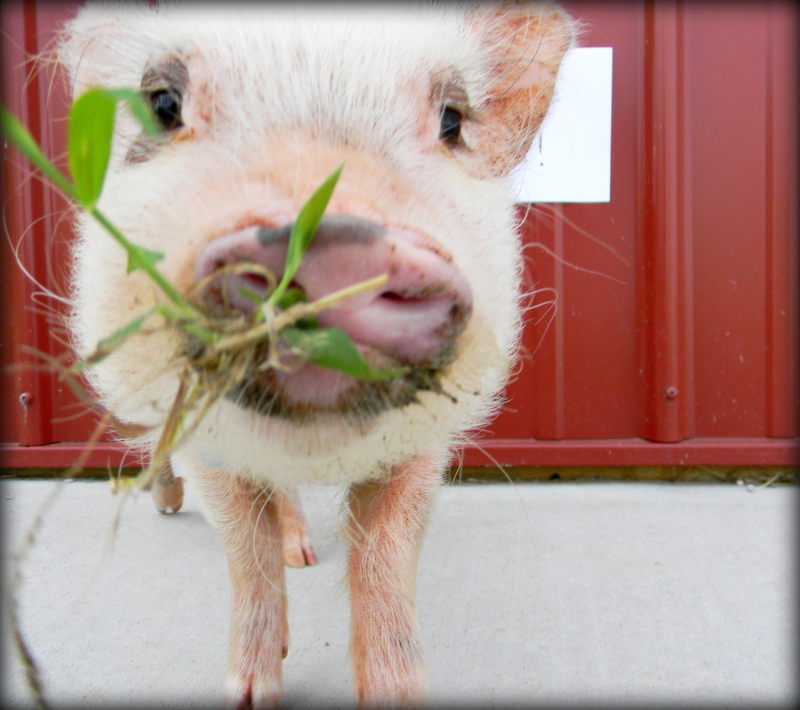 You and Oscar have done a HUGE service to other piggy parents by posting about your experience. Here’s proof: I just returned from the vet with my sweet pig Piper after recognizing in her many of the symptoms you described in Oscar. She is 4 years old; before today she had only been to the vet once, to be spayed when she was a baby. That vet told me that unless she was around other pigs, she didn’t need vaccines or de-worming and would only need vet care if she got sick or had an accident. After I read your posts about Oscar, I realized she was sick, and she did need treatment beyond being spayed. I am indebted to you for writing about Oscar’s experience. If not for your blog, I likely would have continued assuming Piper’s symptoms were normal. She blows her coat every summer and gets dry skin and becomes itchy, but her coat returns and the flaky, itchy skin abates. This summer, however, the problems persisted. When I read your blog I realized this was beyond the normal “pig skin” issues. Thank you. Thank you. Thank you. From me, and from Piper. We are truly grateful. Give Oscar a big hug & kiss from his biggest fans in Texas. Thank you for taking the time to write and let me know the posts about mange were helpful! It means the world to me knowing Piper is getting treatment because of my posts about Oscar. 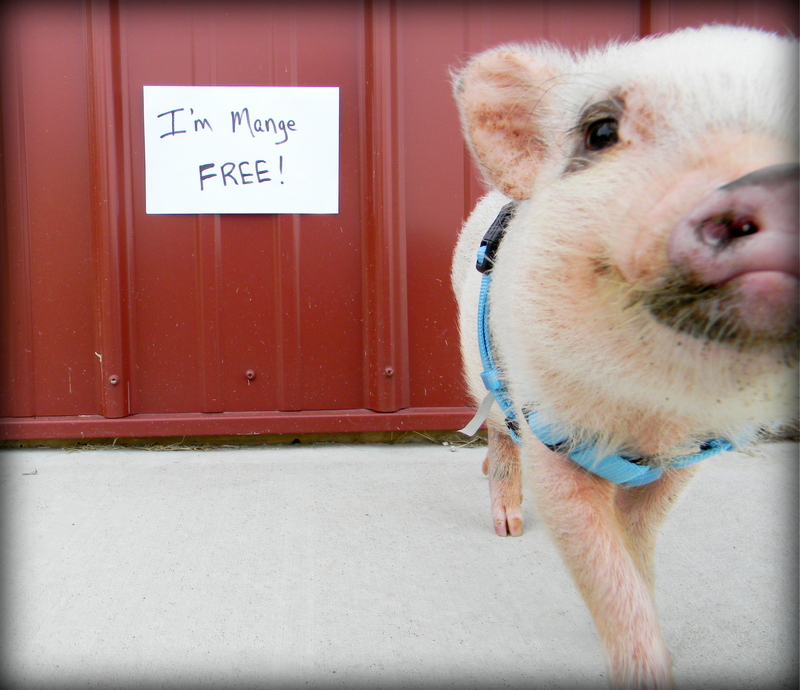 Mange can be difficult to diagnose because it’s hard to tell what’s normal and what’s not for a pig’s skin and itchiness, so I’m glad you were able to see the symptoms and get help for Piper. I hope she gets better and more comfortable soon! With a new blog, it’s hard to tell if it’s making a difference, so again thank you for writing and letting me know about Piper. Give Piper a big hug and kiss back from us and Oscar. Keep me updated on how she’s doing! Do you have any pictures of what his looked like. We just got our sweet Lucy and we are afraid it’s mange. My dad is taking out dog in the morning so if it is the mange we can keep him away. We just lost our sweet Ruby this morning and I am pretty sure it was mange. We are devastated and I just we would have figured it out sooner.